In the Kidron valley is a church built on a rock cut cave that is the tomb of Mary, mother of Jesus. 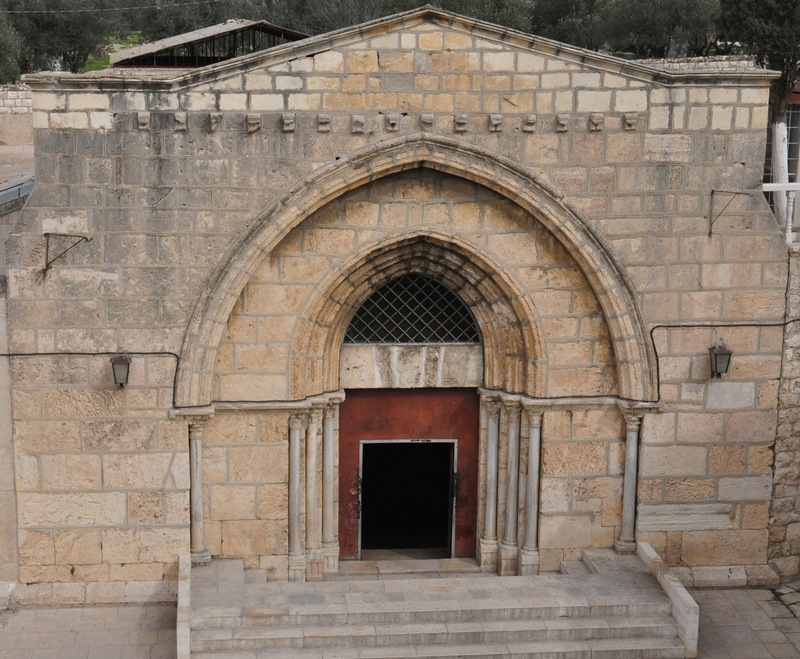 Through the centuries the cruciform (in the shape of a cross) church was destroyed many times but the facade and wide staircase descending to the tomb is from the Crusader period. On the left side of the staircase a chapel to Joseph, Mary’s husband, on the right a chapel to Mary’s parents, Joachim and Anne; Queen Melisende is also buried there. Today the Greek Orthodox Church is in possession of the shrine, sharing it with the Armenian Apostolic Church (the Syriacs, the Copts, and the Abyssinians have minor rights). A niche on the southern wall is a mihrab indicating the direction of Mecca, installed when Muslims had joint rights to the church. In a courtyard off the Via Dolorosa in the Old City is a small church that reminds me of the Crusader church. 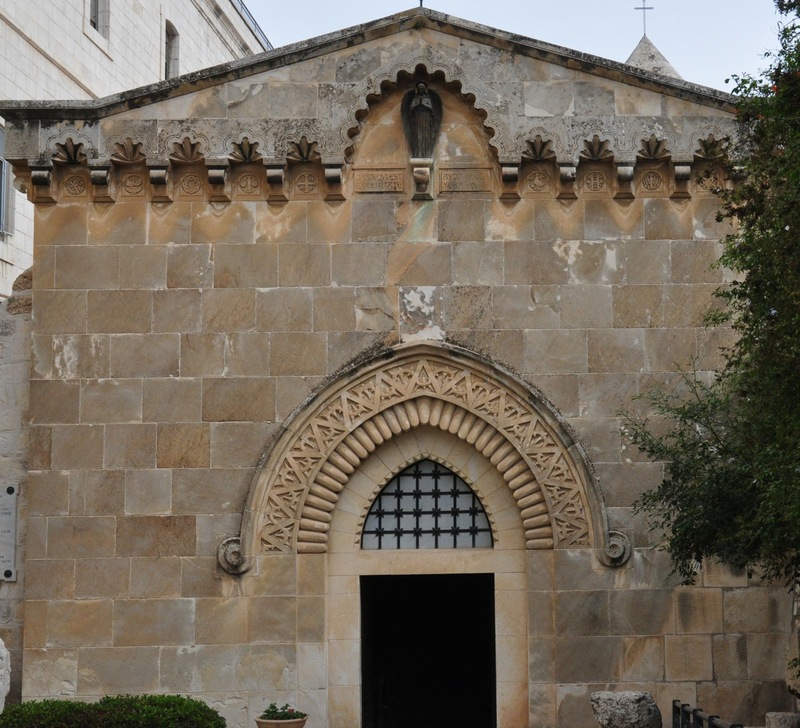 The Church of the Flagellation, marks the Second Station of the Cross, where according to tradition, Roman soldiers flogged Jesus and placed a crown of thorns on his head after he was brought to Pontius Pilate. The architect, Antonio Barluzzi, rebuilt this church in 1929, in medieval style over ancient ruins. Barluzzi designs churches so that the style and decoration preserve the history and recall the events that happened at the site. The facade has one central opening with a Crusader style pillow-shaped arch that incorporates a crown of thorns. There are 10 icons under the roof, a crown of thorns, two representations of a cat of nine tails (see if you can recognize the others, for example there is an image of a rooster and 3 stars*). The floor is made of small, inlaid colored stones in geometric patterns. Probably the most impressive part of the church are three large stained glass windows: on the left, Pilate washing his hands of the affair, on the right, the victory cry of Barabbas, in front, the flogging of Jesus wearing the crown of thorns amidst the soldiers. 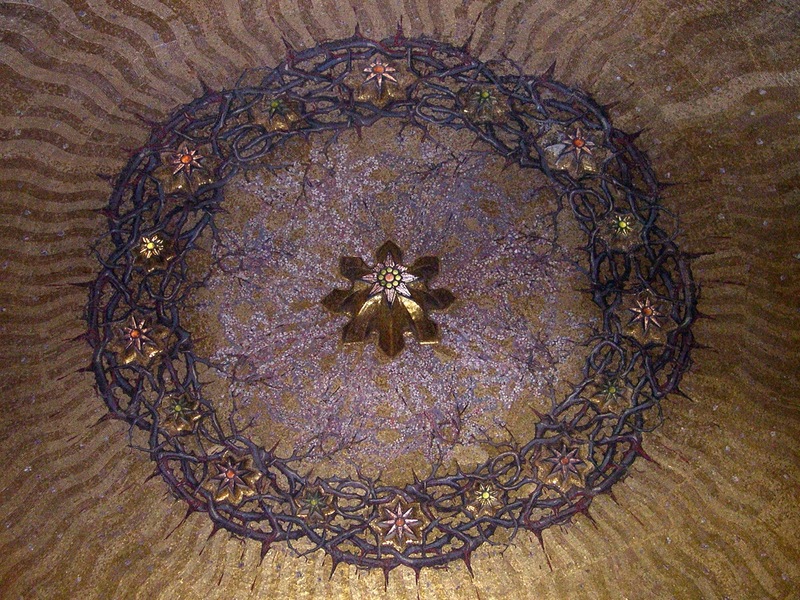 Above is a dome in gold mosaic and decorated with a crown of thorns intertwined with flowers. Click on the thumbnails above to display a larger image (these are quite incredible stained glass images). Included below is a closeup of the dome. 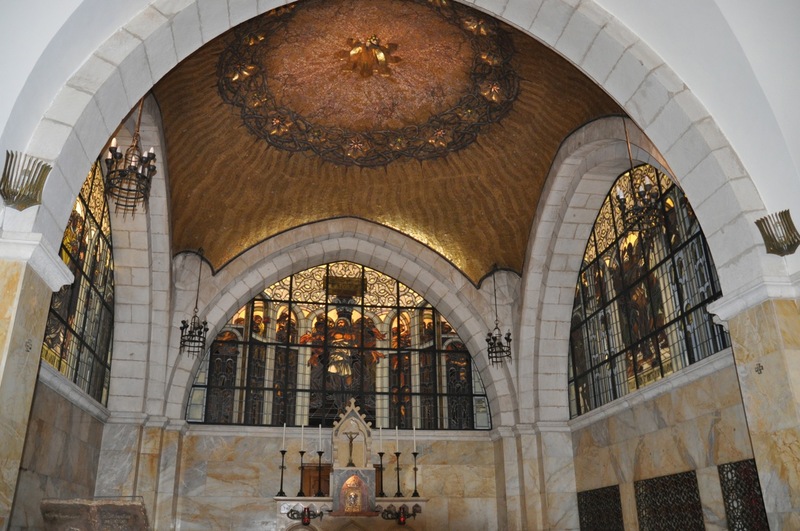 This entry was posted in Architecture, Art, Jerusalem, Mosaics and tagged Barluzzi, church, crown of thorns, Crusader church, mosaic, postaweek2011, stained glass on January 28, 2011 by Shmuel Browns.